Meletios was busy in March – in addition to the landmark Tomos regarding the Orthodox globally, he issued a Tomos of Autocephaly to the Church of Czechoslovakia. The same month, he spent a week negotiating with a Serbian Orthodox delegation regarding the autocephaly of the Serbian Orthodox Church. In early April, Vladimir Lenin arranged for Joseph Stalin to be appointed General Secretary of the Communist Party in Russia. Stalin would hold the position for the next thirty years. Later that month, the communist authorities in Russia – which was still in the midst of a famine – placed Patriarch Tikhon under house arrest. Shortly after this, Tikhon testified at a show trial put on by the Soviets against a group of Orthodox clergymen who had refused to give up sacramental objects – chalices, communion spoons, etc. – to the government. At the end of his testimony, Tikhon concluded, “I bless the faithful servants of the Lord Jesus Christ to suffer and die for Him.” The clergy were then taken away to be executed. All told, some 8,000 Orthodox Christians are estimated to have been killed in 1922 alone, during the conflict over church valuables. The same month, the schismatic, renovationist “Living Church” was started in Russia, with support from the Soviet government. Also in April, the legitimate Russian Holy Synod appointed Metropolitan Platon Rozhdestvensky as the temporary head of its North American Archdiocese. Metropolitan Platon, who had previously led the Archdiocese before transferring to another see in 1914, had returned to America as a refugee from Russia in 1919. The Archdiocese held an All-American Sobor later that year, electing Platon as the head of what became known as the “Russian Metropolia” (and is now the OCA). In May, Lenin suffered a massive stroke that left him nearly paralyzed. The same month, the Communist government coerced the Russian Holy Synod to issue a decree abolishing ROCOR. The decree was not signed by Patriarch Tikhon. ROCOR had to quickly regroup and obtain additional authorization for its existence. Also in May, Ecumenical Patriarch Meletios issued a Tomos, formally transferring the Greek Archdiocese of America from the jurisdiction of Athens to that of Constantinople. In July, the League of Nations adopted the Balfour Declaration, calling for the creation of a Jewish state in Palestine. The League granted the famed “British Mandate for Palestine,” which ultimately led to the creation of the state of Israel. Also in July, a Soviet tribunal sentenced Metropolitan Benjamin of Petrograd and several other Orthodox Christians to death, ostensibly for counter-revolution and for opposing the seizure of holy objects. In August, the saintly Metropolitan – shaved and dressed in rags to conceal his identity from the soldiers who would kill him – was taken outside the city and executed by firing squad. In 1992 the Russian Orthodox Church glorified him. Also in September, the Greek army lost the city of Smyrna to the Turks, and the subsequent Great Fire of Smyrna destroyed the Greek and Armenian quarters of the city, killing thousands. 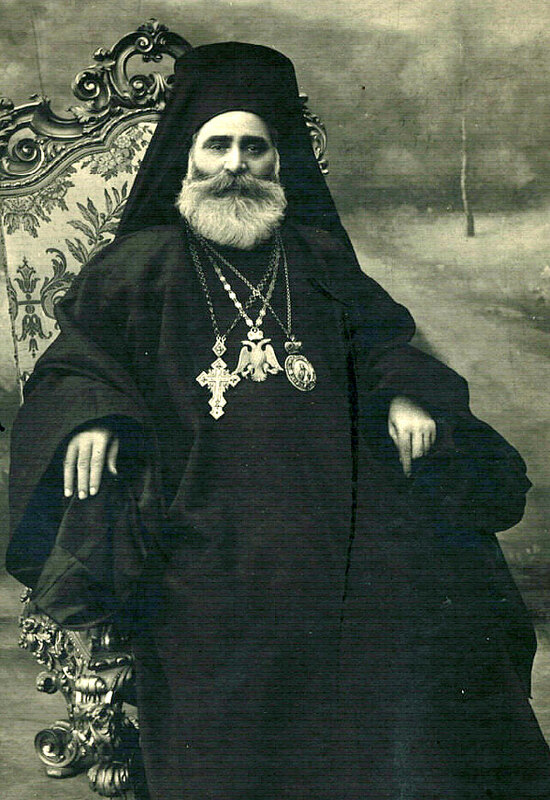 Metropolitan Chrysostomos of Smyrna was captured by the Turkish army, handed over to a mob, and lynched in the presence of French soldiers who were under orders not to intervene. (In 1992 the Church of Greece glorified him.) The Turks massacred and deported untold thousands of Orthodox Christians during these war years. Before the month was over, the Greek military rose up against King Constantine’s government, expelling Constantine and declaring his son George to be king. The new government reversed the state’s position on Patriarch Meletios and ordered the Church of Greece to recognize him as Ecumenical Patriarch. The Archbishop of Athens refused, and was deposed. Also in September – it was a busy month – in Albania, an Orthodox congress was held to establish an autocephalous Albanian Orthodox Church. The congress proclaimed the Albanian Church as autocephalous and elected Metropolitan Fan Noli as its primate. Ecumenical Patriarch Meletios responded by sending a patriarchal exarch to investigate. The exarch congratulated the new Albanian Holy Synod and recommended that the Ecumenical Patriarch invite an Albanian delegation to Constantinople. In October, Patriarch Meletios told an Italian reporter that it might be necessary to move the Ecumenical Patriarchate to Mount Athos. The same month, the Holy Synod of Constantinople met twice to consider moving the Patriarchate out of Turkey. In November, the Lausanne Peace Conference began. This ultimately led to the Treaty of Lausanne, which had far-reaching effects on the Ecumenical Patriarchate and on Greek Orthodoxy in general, and resulted in the infamous “population exchange” between Greece and Turkey. While this was taking place, three renegade bishops set up the “Turkish Orthodox Church,” with support from the Turkish government that sought to undermine the Ecumenical Patriarchate.